Many of us are constantly on the look out for ways to save a dollar and stretch our money further. At the same time everyone needs a treat and a bit of fun. It can get you down to be scrimping all the time. It's nice to have a coffee at a cafe or order a pizza instead of cooking. Some of these places have loyalty cards which offer buy 5 and get the 6th for free or a similar offer. Do these really save you money? In my purse I have a loyalty card from a Vietnamese roll shop and I am looking forward to a free lunch in the near future. I have had a crispy pork roll, my very favourite type, from a few different Vietnamese roll shops around Adelaide. The best one (in my opinion) is made at a shop on Churchill Road. I am in the area once a week so have made it a habit to buy lunch there. The roll is worth the $5.50 price tag and other places tend to charge more. I grabbed a loyalty card as soon as I was offered one because I am going to buy that crispy pork roll, even without the incentive. I view the loyalty card as a bonus. At this shop the offer is buy 10 and get the next one free. Now, I know I could save money by making lunch at home and eating it in a nearby park but I consider the roll worth the money. It tastes so good and is my once a week treat. When it is raining or scorching hot I couldn't eat in the park anyway. When the price on an item is more than the price charged elsewhere it may be you aren't really saving. 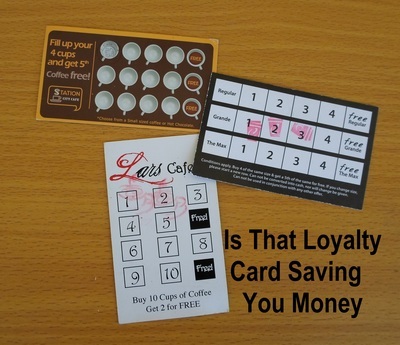 Say you can get a loyalty card at a coffee shop. They charge $4.50 for a cup of coffee but you know there is another coffee place nearby which sells their coffee at $3.60 (same size cup) and it tastes just as good. You need to do a bit of maths or use the calculator on your phone to work out if the loyalty card is saving you money. In this example you pay $4.50 x 5 = $22.50 at the shop that issues you a loyalty card and so, with the free one, 6 coffees totals $22.50. That is, if you remember to produce your loyalty card every time you buy coffee. At the second shop you pay $3.60 x 6 = $21.60 without a loyalty card. As you can see the second shop ends up a bit cheaper and you don't have to remember that card. If the first shop charged $3.60 for a coffee you would save by using a loyalty card. Even if they charged $4 you would still be a bit ahead. A cheaper option is to choose not to buy coffee at all. But if you only buy it sometimes and it is your treat which you look forward to, it's probably worth the money for you. One of the problems of a loyalty card can be the temptation to buy whatever more often than you would if you didn't have the card. You may be misled into believing it isn't affecting your budget because you have a loyalty card. Sometimes a loyalty card can tempt one to pay for something one wouldn't usually. One day you use the car wash because you are particularly tired. When you pay they give you a free car wash loyalty card. May as well use it and get the 6th one free, you tell yourself. Let's face it, washing the car isn't your favourite activity. Depending on which wash option you choose, it may be a lot of money to pay for a service you could do yourself at home for the cost of water and some car wash products. Having said that, some people don't have anywhere to wash a car at home or are unable to do it because of health or physical limitations. Before deciding a loyalty card is saving you money, look at the total cost, whether you are being tempted to spend more than you would otherwise and how much you benefit from the product or service.